If you ask my kids what they loved best about our San Francisco trip, they’ll both say: swimming and the beach. Seriously, I think they could have spent the entire time in the pool at my sister’s place and been completely satisfied. This might be my favorite picture from the trip. 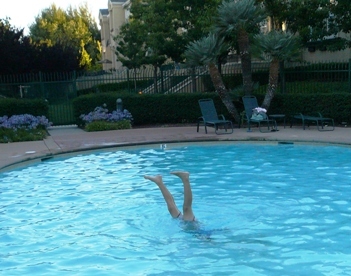 It looks like she might end up doing a colossal belly flop, but she didn’t. I love how she’s reaching for the sky. Now that Geek Girl’s Guide has gone to copy edits (man, that sounds surreal), I’m back to working on The Fine Art of Holding Your Breath, AKA MacKenna’s story. In this pursuit I, of course, got sidetracked on YouTube, looking for synchronized swimming videos. Because, you know, that’s really important for the writing. Also important, if you’re writing a book with a sport, make sure it’s one people like to mock (cheerleading, synchronized swimming, etc.). Note to YouTube users: the video of your Cancun vacation where you’re clearly drunk and pretending to swim synchro? Not really funny. Trust me on that. I’m hoping we get more good video from the Olympics. In the meantime, enjoy the following. Sure, they’re commercials, but they’re also pretty cool. All I can say about the 0:39 point: Ouch. I love the lift in this one. I like the angles of the shots, but I’m not sure how the pieces would look if I were watching poolside. 6 years of gymnastics, and all it took was a major injury and forced lap swims for my son to finally understand what a pointed toe was…..
Love the picture of your daughter. She looks like she’s ready to take flight! Very cool! Like ballet, but with the added challenge of trying to breathe underwater. Did you once do this?